It's February already...can you believe it!? Well, I'm excited...because it means I have an excuse to watch My Big Fat Greek Wedding again! As if I needed an excuse. That's right. 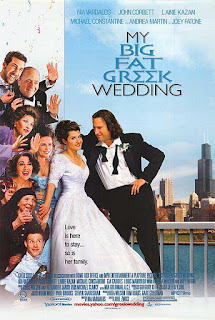 The lovely Deb from Kahakai Kitchen is hosting this month and she has chosen the film My Big Fat Greek Wedding . So rent it, buy it, borrow it, pull it out of your stack of favorite chick-flicks and spend a couple of hours with John Corbett. I mean the whole cast. I'm already craving some Greek eats. Can't wait to see what everybody makes this month. Head on over to check out Deb's ANNOUNCEMENT POST for further information. She's calling for submissions by February 27th...don't let the month pass you by. Check out the Big Fat Greek Roundup over at Deb's place by clicking HERE! I love this movie too, I've seen it like 10 times. I think I know what I am going to do tonight... Gotta love Amazon for the Prime: rent a movie without leaving a house... Have a great weekend!